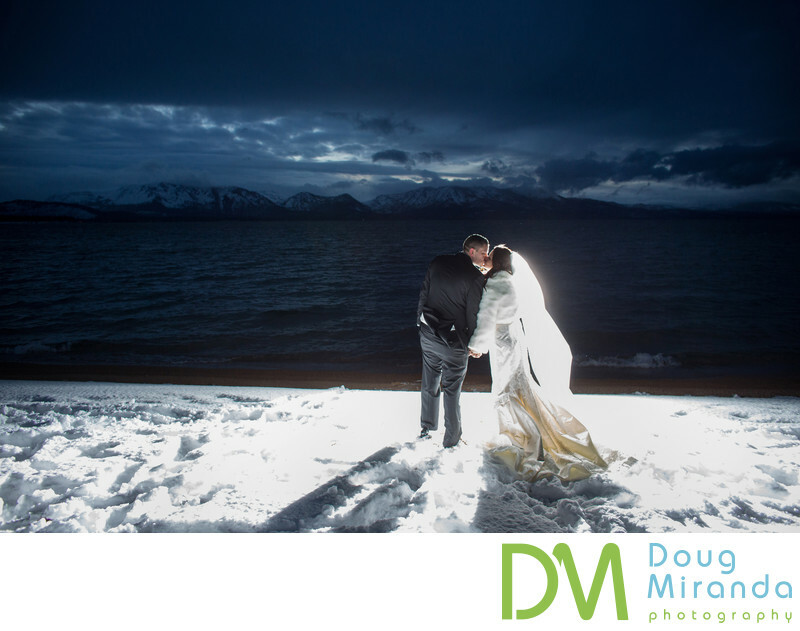 This was such a fun winter wedding in Lake Tahoe at Edgewood Tahoe Golf Course on the south shore. This couple’s wedding ceremony and reception took place about a weeks before Christmas and they were lucky enough to have lots of snow on the ground for their wedding day. Edgewood is such a great location to get married at in Tahoe and is one of the few venues that offer weddings year around. They have a couple of locations to have indoor ceremony and receptions at. You can host your ceremony and reception in the North Room or South Room, depending on how many guests you have attending your event. You can also host your ceremony in the middle of Edgewood’s lobby, which is a gorgeous location to get married at and is the best indoor location there.This lovely couple was married the lobby and had their reception in the North Room, which has huge window walls that overlook Lake Tahoe. The days leading up to their wedding it snowed a couple feet and on their wedding day it was snowing off and on. They truly had a white wedding day. With it getting dark so early in December we had to rush outside right after their ceremony in order to take any photos of the couple together before it was pitch dark. Once outside we head straight for the shore line to get some epic lake and mountain photos for them. It was snowing really hard when we went out and it was about 15 degrees fahrenheit, which made it cold for all of us. I had about ten minutes to take their pictures before the light was gone. This photo was taken right at the end of the session and right when we had a break in the snow storm. It was really dark and I decide to use my flash to try and get a couple more photos of them before we had to go inside. I placed the flash directly in front of them, so that they were back lit for the photograph. I had them look out at the lake for a couple photos, then look at each other and then they ended up kissing. Right after this photo was taken we gathered all our gear up and run in doors to warm up. For some reason I just love this photo, with all the snow on the ground the snowy mountains in the back ground and the couple enjoying a moment on their wedding day. Location: Edgewood Tahoe Golf Course 100 Lake Pkwy, Stateline, NV 89449. Keywords: Edgewood Golf Course (27).